When I get home today my editor’s second edits should be waiting in my mailbox for me. Needless to say, my thoughts today are mostly circling obsessively around the editing process. 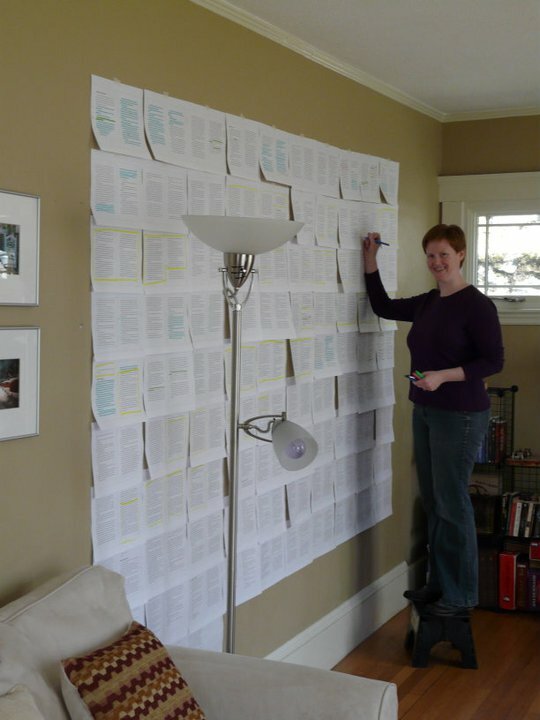 So, I thought I’d share one of my favorite editing tips: see the writing on the wall. It may look strange, but it really helps. No, really, that’s a tip. Print out your whole MSS (“tiny font! two-to-a-page!” says the Lorax) and tape it to your wall. Then grab a variety pack of highlighters and get to work color-coding sections. Use the colors to highlight (ha!) anything you’re worried about balancing across the MSS- if you have different POVs, have a color for each character. Or, see how much time you spend in flashback versus current action. For GOLDEN BOY, I needed to balance exciting scenes against lyrical descriptions. You can use this for pretty much anything: imbalances will literally leap off the page at you and then you can go about fixing them. Hope this helps. Happy editing everyone!